In 1988, the Canadian government put Ernst Zündel on trial a second time for the criminal offense of knowingly disseminating false news about “the Holocaust.” As part of his defense in this trial, Zündel commissioned the U.S. gas-chamber expert Fred Leuchter to make a scientific examination of the alleged homicidal gas chambers at Auschwitz, Birkenau and Majdanek. The resulting Leuchter Report is the first scientific study of the alleged German homicidal gas chambers. Click to learn more about the current edition of The Leuchter Report, read it online or download it free of charge, or buy a hard copy. In addition to reporting that the alleged homicidal gas chambers at Auschwitz, Birkenau and Majdanek were structurally unsuitable for gassing, Leuchter researched the chemical properties of the Zyklon B fumigant. Leuchter found that Zyklon B is a highly toxic compound that releases deadly hydrogen-cyanide gas. The released hydrogen-cyanide gas clings to surfaces and reacts chemically with materials containing iron, forming ferrocyanide compounds that have a distinctive blue color called Prussian Blue. Since building materials normally contain a certain amount of rust (iron oxide, usually between one and four percent), repeated exposure to hydrogen-cyanide gas would result in Prussian Blue staining on the walls of the alleged gas chambers. Leuchter took forensic samples from the alleged gas chambers at the visited sites and a control sample from the delousing facility at Birkenau. The samples were analyzed by an independent laboratory in the United States. The laboratory found no significant ferrocyanide compound traces in the samples taken from the alleged homicidal gas chambers, but the sample from a wall of the Birkenau delousing facility had heavy concentrations of the ferrocyanide compounds. Leuchter concluded that this result would be impossible if the alleged homicidal gas chambers had been repeatedly exposed to hydrogen-cyanide gas. Click to learn more about the current edition of Rudolf's research results, read it online or download it free of charge, or buy a hard copy. Germar Rudolf, a certified chemist, expanded on Leuchter’s work by writing the Rudolf Report in the spring of 1992. 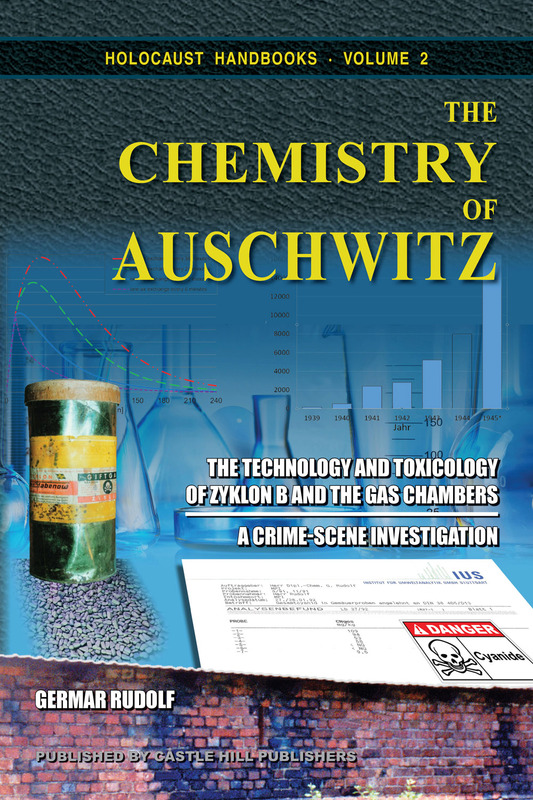 The Rudolf Report, which has been updated and revised several times, focused on engineering and chemical aspects of the alleged homicidal gas chambers at Auschwitz and Birkenau. Rudolf observed in his on-site examinations that all of the delousing facilities at Auschwitz, Birkenau, Stutthof and Majdanek have one thing in common: their walls are permeated with Prussian Blue. Not only the inner surfaces, but also the exteriors of the walls and the mortar between the bricks of the delousing facilities have Prussian Blue staining. Nothing of this sort can be observed in any of the alleged homicidal gas chambers at Auschwitz and Birkenau. Rudolf also took samples from the alleged homicidal gas chambers and the delousing facilities at Auschwitz and Birkenau. Similar to Leuchter’s samples, the alleged homicidal gas chambers exhibit only insignificant traces of ferrocyanide residue on the same order of magnitude as found in any other building. The samples from the delousing chambers, however, all showed very high ferrocyanide residues. Rudolf determined that, if mass execution gassings with hydrocyanic acid had taken place in the alleged homicidal gas chambers, the rooms in the alleged homicidal gas chambers would exhibit similar ferrocyanide residue as the delousing chambers. Therefore, Rudolf concluded that mass gassings with Zyklon B did not occur in the alleged homicidal gas chambers at Auschwitz and Birkenau. The Kraków Institute of Forensic Research published results in 1994 that attempted to refute the Leuchter Report. The team from this forensic institute led by Dr. Jan Markiewicz claims not to have understood how it was possible for Prussian Blue to have formed in walls as a result of their being exposed to hydrogen-cyanide gas. The researchers therefore excluded Prussian Blue and similar iron-cyanide compounds from their analyses, resulting in much lower cyanide traces for the delousing chambers. Their analysis made it practically impossible to distinguish between rooms massively exposed to hydrogen cyanide and those which were not: all would have a cyanide residue of close to zero. The Kraków researchers concluded from their analysis that since the gas chambers and delousing facilities all had the same amount of cyanide residues, humans were gassed in the gas chambers. 1. It is a fact that the walls of the disinfestation chambers in Auschwitz, Birkenau, Stutthof, and Majdanek are saturated with cyanide compounds, and this not only superficially, but into the depth of the masonry, as I have demonstrated by taking samples from different depths of the wall. Compare in this regard my mortar and plaster Sample Pairs 9 & 11, 12 & 13, 19a & b. […], which were each taken at the same spot but at different depths, as well as Sample 17, taken from below the overlying lime plaster (which is thus similar to 19b). These values prove that hydrogen cyanide can rather easily reach deep layers of plaster and mortar. But even the other samples taken from the surface prove that Prof. Roth’s allegation is wrong: Provided that most of the cyanide detectable today is present in the form of iron cyanide (Iron Blue and other cyanoferrates), as Prof. Roth assumes himself, his thesis would mean that 10% to 75% of the iron content of these samples are located in the upper 10 micrometers thin layer of the samples (0.010 mm), i.e., they are located in less than 1% of the entire sample mass. The rest of the samples, however, would have been massively deprived of iron. How this migration of a major portion of iron to a thin surface layer would have happened is inexplicable to me. Fact is that this simply could not happen. 3. In addition, it is generally known that cement and lime mortar are highly porous materials, comparable for instance to sponges. In such materials, there does not exist anything like a defined layer of 0.01 mm beyond which hydrogen cyanide could not diffuse, as there can also be no reason, why water could not penetrate a sponge deeper than a millimeter. Steam, for example, which behaves physically comparable to hydrogen cyanide, can very easily penetrate walls. 4. Finally, the massive discolorations of the outside of the walls of the disinfestation chambers in Birkenau and Stutthof, as shown in this expert report, are clearly visible and conclusive evidence for the fact of how easily hydrogen cyanide and its soluble derivatives can and do penetrate such walls. they had no effective device to ventilate or otherwise render ineffective the poison gas after the execution. Rudolf, Germar, “Some Technical and Chemical Considerations about the ‘Gas Chambers’ of Auschwitz and Birkenau,” in Gauss, Ernst (ed. ), Dissecting the Holocaust: The Growing Critique of Truth and Memory, Capshaw, AL: Thesis and Dissertations Press, 2000, p. 337. 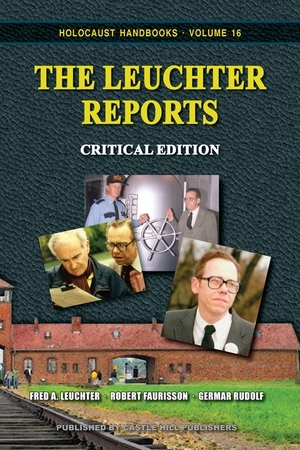 See the currently available edition of Leuchter’s report: Fred A. Leuchter, Robert Faurisson, Germar Rudolf, The Leuchter Reports: Critical Edition, 4th ed., Castle Hill Publishers, Uckfield 2015. Rudolf, Germar, “Some Technical…,” op. cit. (note 3), pp. 363-371. The first English edition of Rudolf’s report appeared in 2003: The Rudolf Report, Theses & Dissertations Press, Chicago, IL, 2003. Rudolf, Germar, “A Brief History…,” op. cit. (note 4), p. 9. Rudolf, Germar, “Some Technical…,” op. cit. (note 3), p. 369.
 https://en.wikiquote.org/wiki/Mr._Death; Richard J. Green, “Report of Richard J. Green,” introduced in evidence during the libel case before the Queen’s Bench Division, Royal Courts of Justice, Strand, London, David John Cawdell Irving vs. (1) Penguin Books Limited, (2) Deborah E. Lipstadt, ref. 1996 I. No. 1113, 2001, p. 16; http://www.phdn.org/archives/holocaust-history.org/irving-david/rudolf/affweb.pdf. Kollerstrom, Nicholas, Breaking the Spell, op. cit. (note 9), p. 66. Richard J. Green, “Report of Richard J. Green,” op. cit. (note 12), pp. 18, 36, 41. Rudolf, Germar, The Chemistry…, op. cit. (note 14), pp. 347-349. Richard J. Green, “Report of Richard J. Green,” op. cit. (note 12), p. 51. Rudolf, Germar, The Chemistry…, op. cit. (note 14), p. 345. Berg, Friedrich P., “Zyklon B and the German Delousing Chambers,” Journal of Historical Review, Vol. 7, No. 1, Spring 1986, pp. 73-94; http://www.ihr.org/jhr/v07/v07p-73_Berg.html. Rudolf, Germar, The Chemistry…, op. cit. (note 14), p. 114. Kollerstrom, Nicholas, Breaking the Spell, op. cit. (note 9), p. 70.